One year ago, on the first day of Hanukkah, a teenager smoking a hookah tossed the charcoal from the pipe into an illegal garbage dump outside Isfiya, Israel. Later that morning the adjacent forests of Mount Carmel, Israel's largest national park, exploded with the worst wildfire in the nation's history. By 4 p.m. that afternoon, the blaze had killed or mortally wounded three of the nation's top police officials - including the highest ranking woman ever in the Israeli police - along with two firemen, 37 prison-office cadets, their driver, and a 16-year-old fire scout. The fire destroyed nearly a third of the houses in Kibbutz Beit Oren, forced the evacuation of 17.000 people, and burned 10,500 acres, destroying five million trees. Firefighters and pilots from nineteen nations came to Israel to assist putting out the blaze. This month, family members of the victims of the Mount Carmel fire, residents of the burned communities, firefighters, police officers, prison officials, foresters, scientists and government leaders have marked the anniversary of the fire that darkened Israel's "Festival of Light." 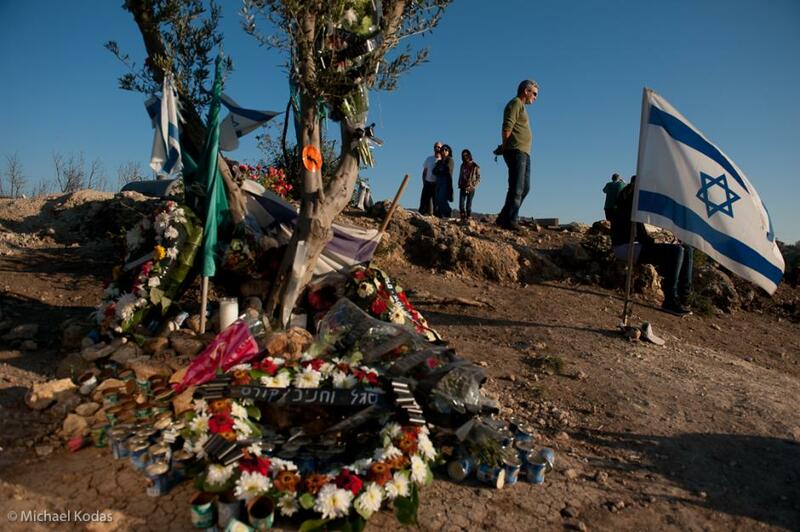 On the day of the one-year anniversary of the Mount Carmel wildfire, Israelis visit the makeshift memorial making the spot where 44 police officers, firefighters, prison cadets, and firefighters were killed when they were overrun by the blaze in the forests outside of Haifa. It was the worst natural disaster in the history of Israel. A students at the Hebrew Reali school in Haifa, Israel, attaches a paper airplane he has folded to a balloon as part of a ceremony honoring Elad Riven, a 16-year-old student at the school who was killed in the Mount Carmel wildfire on the first day of Hanukkah last year. The school prepares students for their mandatory military service in Israel. Elad Riven had dreamed of being a pilot and often folded paper airplanes. The Principal of the Hebrew Reali school in Haifa dons a t-shirt with the face of Elad Riven on it. Riven, a students at the school, left his civics class a year ago to help fight the Mount Carmel fire. He was killed in the blaze later that day. Elad Riven was a 16-year-old fire scout when he was killed in the Mount Carmel fire, the first fire that he actually got to fight. Since his death, Israel's new fleet of firefighting planes, a grove of trees, and a new firefighting substation in the town of Nesher, have been named for Riven. The commander of the Nesher station, Yossef Ben Yossef, looks over the memorial to Riven in the new station. Shaul Shimon, a Haifa firefighter, visits the forest outside the village of Isfiya where a youth with a hookah was suspected of starting the deadly Mount Carmel fire. 12-1-11 -- Family and friends of fallen prison cadets, firefighters and police officers at a ceremony honoring their loved ones at Haifa University. 12-1-11--Family members of the police officer, firemen, prison cadets and civilians killed in the Mount Carmel wildfire receive roses and consolation from students at Haifa University. Dany Rossen, the long-time boyfriend of Ahuva Tomer, the Haifa Police Chief who was killed in the Mount Carmel fire, weeps at a memorial honoring the 44 people killed in the disaster. I had not heard of this fire before this. Thanks for bringing it and the larger issue of forest fires to my attention.